As many of you know, we recently reopened our storefront in Oshkosh, Wisconsin but some of you may not know that there is actually a second independently owned Green 3 storefront in Princeton Wisconsin on Water Street! We wanted to do a profile on this store and the lovely couple that owns it! What follows is my interview with Jess Greget (owner and merchandiser for the storefront) from earlier this week. Matt Greget and one of his business partners opened up a retail store called Daiseye in 2002 (the store just celebrated their 16th birthday this month). Their dream for Daiseye was a storefront with exclusively Earth-friendly and fair trade products. The store started out with mostly home decor, toys, as well as a small collection of accessories. After getting married, Jess Greget (Matt’s wife) came in to help run the business six years ago in 2012. She began to incorporate more women’s clothing and accessories than Daiseye previously had. Previous to Daiseye, Jess only had a small amount of retail experience but she loved the artistic, creative side of running a clothing store. She seized the opportunity to expand the Daiseye brand, finding amazing earth friendly and fair trade brands to showcase. Some of the best sellers at Daiseye/Green 3 storefront are the tunics and a-line skirts. The customers love the more modest fit of the items especially because we didn’t sacrifice style or fit for modesty! The Over Arm-ers are also starting to become more popular. Jess’s favorite items include the reversible poly skirts and anything space dye. 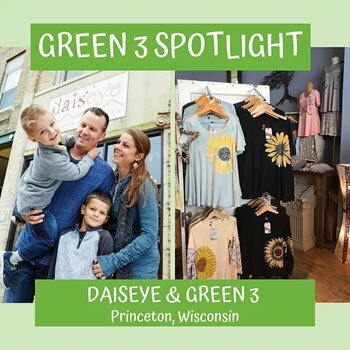 Daiseye and Green 3 are located in downtown Princeton at 525 W Water St Princeton, WI 54968. Their hours are as follows: Everyday, 7 days a week: Mondays-Saturday 10-5, Sundays 11-3pm. Linked below is their website and social media accounts--head over and check them out!